Max Berns: You guys look like garbage. Sonny Hooper: You should see through my eyes, it's metro color. Sonny Hooper: [Slaps Cully] Dont yell in my ear! Jesus Christ. Cully: [Hears something coming towards them, it's Ski on a motorized skateboard] What the hell is that? Look what's coming. Sonny Hooper: [Covers his ears] Stop that thing! Shoot it! Kill it! Ski: [Holds up a breakfast burrito] want some breakfast? Sonny Hooper: [Belches] Oh God, get that circumcised will you. 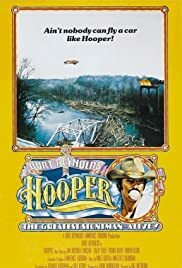 "Hooper" is a delightful tribute by star Burt Reynolds and director Hal Needham - both of whom began their careers as stuntmen - to those brave men and women who risk life and limb for the movies. It remains endearing and upbeat throughout, sometimes getting serious but never melodramatic. It's naturally jam packed with amazing stunt work, and quite a few explosions as well. The cast is completely engaging, and everything is played with a respectable amount of humour. Burt plays Sonny Hooper, an old pro stuntman who realizes that a new day is coming, and that a new breed is emerging: younger, tougher, more daring. A prime example is up and comer "Ski" (Jan-Michael Vincent), who comes to work on the same movie that Sonny is currently gaffing. It's Ski who encourages Sonny to try one of the riskiest car stunts ever filmed. "Hooper" has just enough story to be involving, and one can't help but like these characters. Burt is charming, with an incredibly foxy Sally Field playing Gwen, the girlfriend who stands by him. Vincent is very likable, as are the supporting performers such as Brian Keith, John Marley, James Best, Adam West (in what is really a nothing role, as the actor for whom Sonny doubles), George Furth, Don 'Red' Barry, Robert Tessier, and Tara Buckman. Comedian Robert Klein is good as Roger Deal, the jerk director of the movie-within-the-movie, who cares not for going over budget or risking lives as long as he gets his shots. Burt has a great moment right at the end as he acknowledges us in the audience before providing us with an appropriate and satisfying punchline.